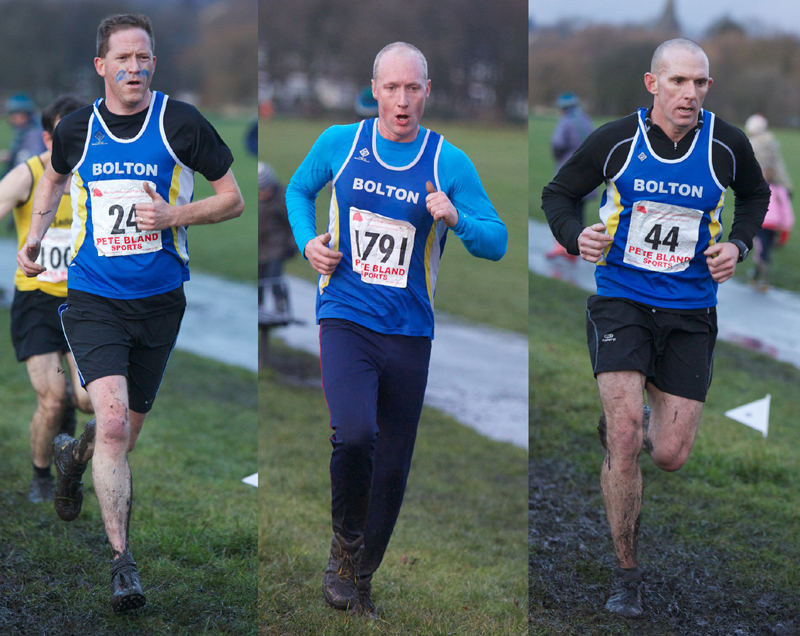 Bolton Paint The Town In X-Country Red! 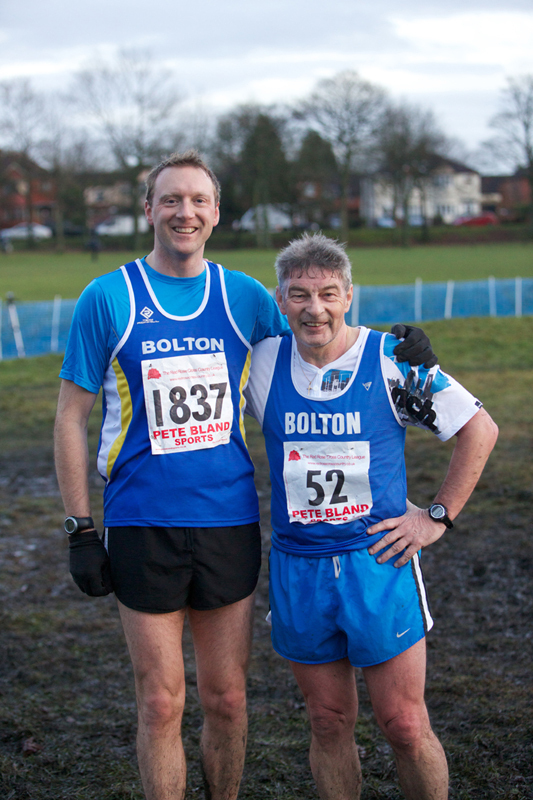 The fourth and final round of the Red Rose Cross Country series took place in Leverhulme Park on Saturday and suitably, a number of Bolton United Harriers rose to the challenge and drama of their home fixture. Literally first and foremost, 2011 champion Tom Carson was looking to retain his title after coming under pressure from Chris Fell last month. His tactics were simple: finish ahead of the Rossendale man. After his customary starting burst, Carson kept his nerve over the three lap course by allowing Salford’s Gary Priestley (36:13), who was not a contender for the overall title, to overtake and gradually stretch away for the line. 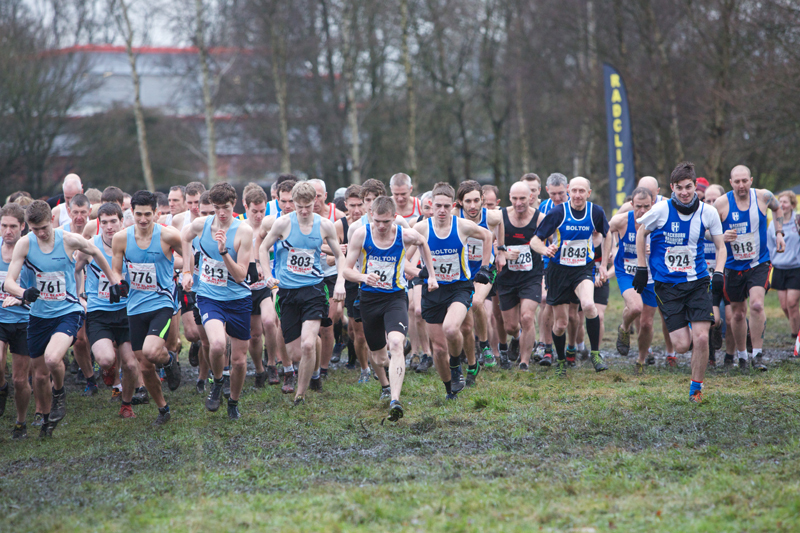 It proved decisive as Carson had saved his legs for a surge over the final half lap, edging second position (36:33) from Cambridge’s Alex Young with Fell in fourth (36:48). Frazer Jardine (37:17) erased his out-of-sorts turn at Hyndburn with a brilliant display to take fifth position, whilst Marc Tillotson’s seventh (38:08) capped an incredibly quick comeback from summer injury to collect the series’ Bronze. With Marc Zeller (12th) impressing again and Tony Valentine making a rare x-country appearance (17th), Andrew Cafferky’s battle for 39th marked him as sixth counter for the Team. This was crucial as it gave the Senior Men (60) victory over Rossendale (72) in the race, and importantly claim the Series Team prize (again from Rossendale) by the slenderest of margins (248-250). 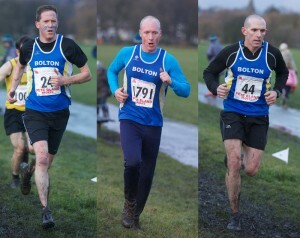 Performances of the day undoubtedly belonged to Chris Povey, Dean Johnson and Andrew Doyle. After selflessly rushing to aid another injured runner, they found themselves nearly 1km away as the starting gun was fired for the Men’s race. Strong-minded commitment then saw the trio scamper back to commence the race with 8 minutes already on the clock. Working as a team, they picked their way through the field to finish in creditable third quarter positions, despite having prior high hopes for the top 50. The main race itself had been delayed by 20 minutes and may not have gone ahead but for their assistance, so Dave Hanson’s debut and Eric Ranicar’s M60 2nd would also have been missed. A poignant note was also struck by life member Ken Cottam who completed the race alongside outgoing club Chairman Scott Whittle. 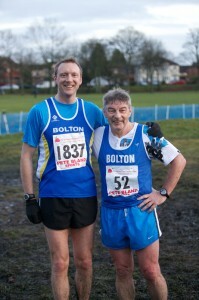 He was honouring an agreement to compete with fellow Bolton veteran Brian Mawdsley, who passed away earlier this year. Disappointingly for Jonny Kay, the pre-race favourite for the u20 title having led the series contest from the start, shin splints forced him to watch from the sidelines as Leigh’s Liam Moore pipped him by a single point to inherit Carson’s under 20 title. In the Women’s race, Leigh’s Laura Riches confirmed her class with another race victory (21:51), repeating Tom Carson’s 2011 feat of a Junior and Senior title double. Shannon Johnson’s 23:31 for overall sixth position gave her the Silver medal in the u20 series competition. She was joined by Sarah Saxon (26:42), Julie Lomax (30:42) and Heather McEwen (39:39) on the team (8th of 13). Unusually for a home fixture, the junior teams had a low turnout. Joe Gande narrowly missed a medal in the u13 competition (4th) after his 9:26 (6th) in the race, with Luke Entwistle (9:54) close in tow. For the girls, Georgia Greenhalgh (10:57) led home Leah Rushworth (11:57), Shannon McClarence (12:37), Ellie Forrest (14:23) and Sophie Green (14:29). Excellent eighths in the u15 race and series were claimed by Katie Oakley (19:06) and Matthew Walker (16:29), whilst Will Grimshaw (21:49), Hywel Scourfield (23:21) and Megan Robinson (33:10) showed improvement for the u17s. The u11s had Alice Tonge (8:14 – 13th) leading the way, with Molly Philbin (8:36), Amelia Thornley (10:13) and Patrick McClarence (9:08) appearing. Click HERE for Club photos or HERE for RunningPix photos.